OfficeUS Repository. United States Pavilion at the 14th International Architecture Exhibition - la Biennale di Venezia. Photo by Patricia Parinejad. 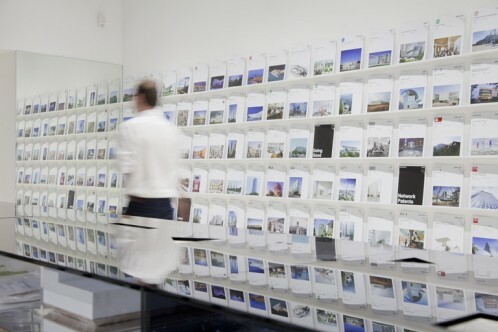 The OfficeUS Repository presents a curated collection of 1001 architecture projects from the last 100 years, designed by 200 US-based architecture firms and realized abroad. The Repository is one of the key elements of Office US , the United States Pavilion at the 2014 Venice Architecture Biennale for which Storefront has been commissioned. Collectively, the projects in the archive tell multiple, imbricated stories of U.S. firms, typologies, and technologies. The office consists of 8 architects selected from an international open call, visiting experts, and outpost offices distributed worldwide. Over the 25 weeks of the Biennale, Office US revisits the projects in the archive, their premises and conclusions, to construct an agenda for the future production of architecture. 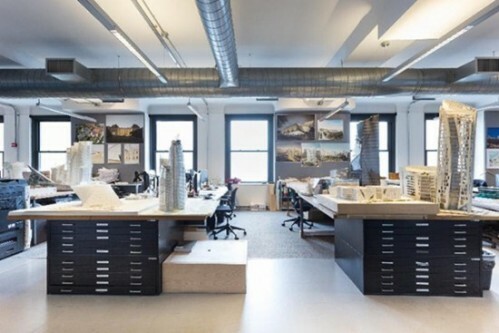 These private tours will bring a glimpse of OfficeUS to New York, offering the opportunity to learn more about the involvement of the firms in OfficeUS, the structure of the office, and their current work. This tour is free for Storefront Members. RSVP is required on a first come, first serve basis. If you are a Storefront Member and would like to attend, please send your RSVP to Kara Meyer at km@storefrontnews.org. If you are interested in attending by becoming a member, click here. I f you have any questions, please email membership@storefrontnews.org. Office Portrait. Photo by Silja Magg. LOT-EK has achieved high visibility in the architecture/design/art world for its sustainable and innovative approach to construction, materials and space through the upcycling of existing industrial objects and systems not originally intended for architecture. 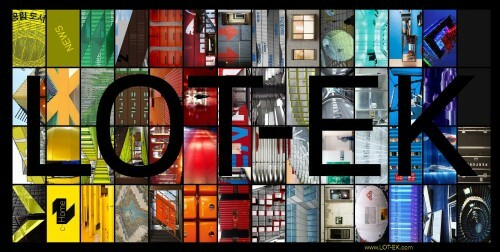 LOT-EK is a design studio based in Naples and New York. Founded in 1993 by Ada Tolla and Giuseppe Lignano, it has been involved in residential, commercial and institutional projects in the US and abroad, as well as projects for major cultural institutions and museums including MoMA, the Whitney Museum, the Guggenheim and the MAXXI. LOT-EK’s founding partners, Ada Tolla and Giuseppe Lignano, have a Masters Degree in Architecture and Urban Design from the Universita’ di Napoli, Italy (1989), and have completed post-graduate studies at Columbia University, New York (1990-1991). Besides heading their professional practice, they also teach at Columbia University, Graduate School of Architecture, Planning and Preservation and lecture at major universities and institutions throughout the US and abroad. In December 2011, Ada and Giuseppe were recognized as USA Booth Fellows of Architecture & Design by United States Artists (USA). 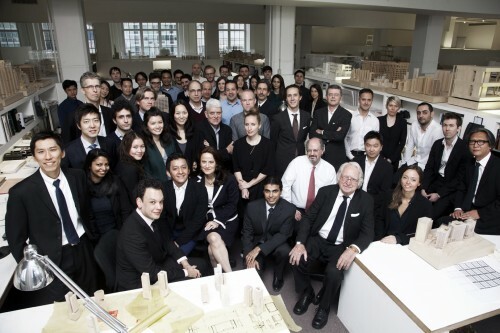 Selldorf Architects is a 65-person architectural design practice that was founded by Annabelle Selldorf in 1988. 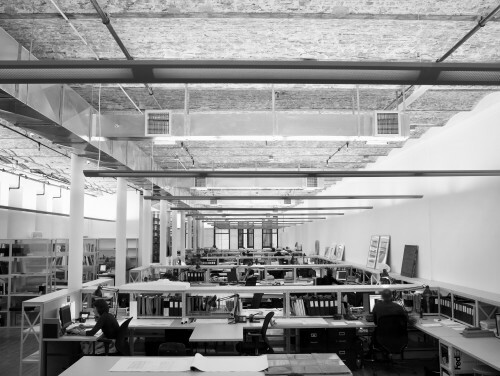 The firm’s work includes public and private projects that range from museums and libraries to a recycling facility, and at scales encompassing the construction of new buildings, restoration of historic interiors, and exhibition design. Creating buildings that are both contemporary and timeless is a fundamental goal of the firm. The practice designs buildings and public spaces that are an integrated and authentic reflection of the cities and institutions they serve. Projects evolve in response to their specific context and program, drawing influence from local materials and building traditions. This context-driven approach is guided by rigor, precision, and restraint. The firm’s clients include cultural institutions and universities such as the Museum of Contemporary Art San Diego, Neue Galerie New York, the Sterling and Francine Clark Art Institute, and Brown University. In addition, the firm has created numerous galleries for David Zwirner, Hauser & Wirth, and Gladstone Gallery among others, and designed exhibitions for Frieze Masters and the 2013 Venice Art Biennial. Selldorf Architects recently completed a 30,000 sf LEED Gold gallery building for David Zwirner and finished work on the Sunset Park Material Recovery Facility, a new recycling facility and education center on the Brooklyn waterfront. In July, the firm’s renovation of the Sterling and Francine Clark Art Institute’s Museum Building opened to the public, followed by the opening of the Manton Research Center Renovation in early 2015. Selldorf Architects is currently designing an expansion for the Museum of Contemporary Art San Diego; converting a former rail depot into LUMA Arles, a new contemporary art center in Arles France; and renovating Brown University’s library for special collections. Annabelle Selldorf is the Principal of Selldorf Architects. Born and raised in Germany, she received a Bachelor of Architecture degree from Pratt Institute and a Master of Architecture degree from Syracuse University in Florence, Italy. Ms. Selldorf is a Fellow of the American Institute of Architects, an Academician of the National Academy Museum, and serves on the Board of the Architectural League of New York and the Chinati Foundation. Acconci Studio ’s design & architecture comes from another direction, from Vito Acconci’s backgrounds in writing & art. His poems in the late 60’s treated language as matter (words to look at rather than through) & the page as a field to travel over; his performances in the early 70’s helped shift art from object to interaction between art-doer & viewer; later in the 70’s, his installations turned viewers into participants; in the early 80’s, his architectural-units could be transformed by users. By the late 80’s his work crossed over & he formed Acconci Studio, a design firm that mixes poetry & geometry, computer-scripting & sentence-structure, narrative & biology, chemistry & social-science. The Studio uses computers to give form to thinking; they use forms to find ideas. They make not nodes so much as circulation-routes, they design time as much as space. Their design starts with clothing & ends with vehicles – in-between, they design buildings that slip into landscape & vice versa; they make spaces fluid, changeable & portable; they make architecture subservient to people & not vice versa — they anticipate cities on the move. Built in the last decade are, in Graz, a person-made island where the theater, a bowl, twists to become a playground on its way to becoming a dome, a restaurant; in Tokyo, a clothing store as soft as clothing; in Coney Island an elevated subway-station façade that waves & bulges to make views & seats; in Toronto, a building-complex fence that twists & rises up the building to make wind-screens, & splits to make public-places. Being built now, in Indianapolis, is an interactive tunnel through a building where pedestrians & cyclists set off lights that swarm around them like fireflies. Led by partners Daniel Libeskind and Nina Libeskind, CEO/principal Carla Swickerath, and principals Yama Karim and Stefan Blach, Studio Daniel Libeskind designs in a variety of scales for a range of uses all around the world. As well as the museum typology, for which it is perhaps best known, the studio develops schemes for public housing, residential towers, mixed-use commercial centers, concert halls, memorials, university buildings, and convention centers. A series of master plan commissions have deeply engaged the studio in urban design and city making and the vast array of issues and ideas that pertain to building sustainably for the future. As well as its New York headquarters, the Studio Daniel Libeskind also maintains Libeskind Design, a product division in Milan, and an office in Zürich.